A prominent hooked beak makes the parrot stand out from other bird species. The upper beak is hinged to give it precise dexterity and strength for cracking seeds and manipulating objects in its environment. The beak’s horny outer layer is covered in keratin -- much like our fingernails -- and comes in a variety of colors. Parrot beak color is predominantly dependent upon a parrot's species. Many breeds of macaws have black beaks, including hyacinth, Hahn's and blue and gold macaws. Other species, such as greenwing and Catalina macaws, have light-colored beaks. Indian ringneck parrots have beaks that range from scarlet red to deep purple. Others, like great billed parrots, have bright orange beaks. Some parrots have beaks with several colors, such as the moustached parakeet and toucan. Some breeds of parrot -- such as parakeets and the Eclectus parrot -- undergo color changes in their beaks from hatch until they are fully mature. A baby Eclectus parrot arrives in the world with a pinkish beak, which darkens in the first two months. At this age, male beaks are black-tipped with gold and females' are slightly lighter. During their first year, the beaks take on adult colors, with female beaks turning jet black. Males beaks lighten and become yellow with bright orange mottling. 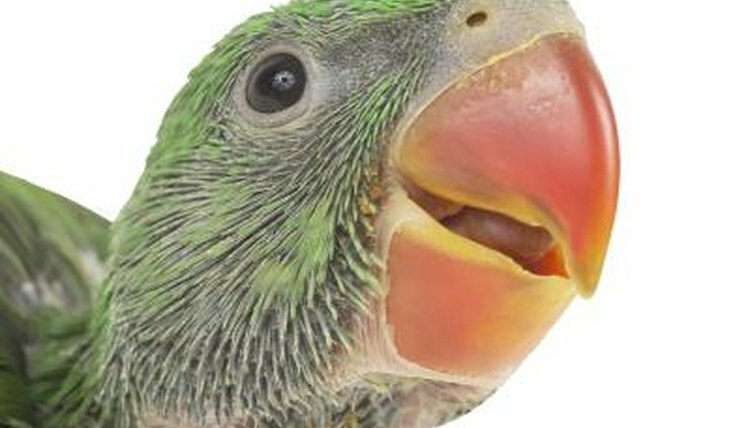 Parrots with light-colored beaks will easily display bruising should they fly into a window or other hard object. The bruise looks similar to a bruised fingernail, with color ranging from dark purple to reddish. Fights with another bird are another common cause of beak discoloration due to bruising. Birds have been known to break another’s beak -- a condition that requires immediate veterinary care -- so make sure birds that don’t get along are housed separately. Bruising is less noticeable on birds with black beaks, but your parrot may show pain symptoms such as not climbing or refusing to eat. Like human fingernails, a parrot's beak is a good indicator of general health. If your parrot's beak is deeply imbued with its natural color and is not flaking or splitting, your feeding and care program is meeting his needs adequately. A faded beak indicates a need for increased nutrition and possible trip to the veterinarian for a checkup. Brownish or blackish spots indicate anything from mites or bacterial infection to cancer, so consult your veterinarian should your parrot develop abnormal discoloration.